Limited edition prints available from the artist. Price 75.00 GBP. 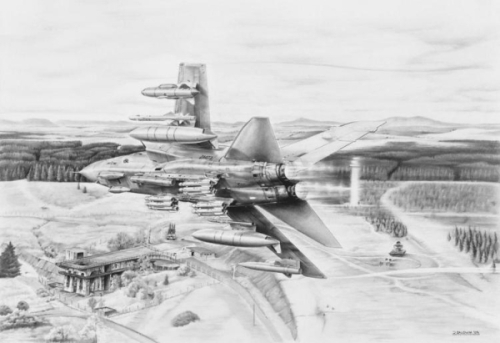 This original aviation art pencil drawing by James Baldwin is of a Tornado GR4 of number 14 Squadron flying over RAF Spadeadam in north west England. 'Fire and Brimstone' is an apt name for this original commission by the RAF station as the Tornado, in afterburner, is carrying an array of the new Brimstone missile. The Tornado GR4 has probably been the most successful ground attack aircraft of modern times. Currently in service with the Royal Air Force as well as the German, Italian and Royal Saudi air forces it was designed as a multi-role combat aircraft during the Cold War. With the RAF, the Tornado has been on continuous combat duty since the Gulf War at beginning of 1991. After the Gulf war the Tornado provided vital reconnaissance and offensive support to the No Fly Zone operations over Iraq between 1991 and 2003, and was often described by Coalition commanders as 'the platform of choice'. It is very capable. During the period the Tornado also saw action over the Former Republic of Yugoslavia during the Kosovo conflict. Since then the Tornado has been involved in operations over Iraq, Afhganistan and Libya. No. 13 and 14 Tornado squadrons were removed from service by the Conservative and Liberal coalition government in june 2011 as part of cuts to the defence budget. However, for a number of months afterwards, the pilots and navigators were still needed to fly with other squadrons in the Libya conflict.